Over the past few years Joel and I have been working to provide an outside space for our family to grow into and up with. 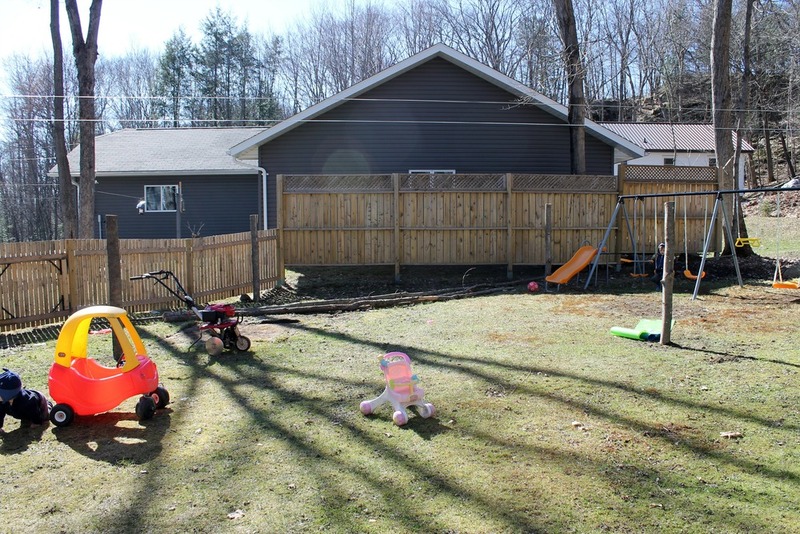 We created a safe back yard area for the kids and tried to add curb appeal with a few gardens, window boxes, and various clean-up projects around the outside. I mean really the large garbage filled dumpster screams ugly, but with four in diapers and eight people living here, we create garbage in our sleep – the bin is staying (at least for awhile). Usually about mid-winter I dream up a new plan for the outside, my new obsession somehow lifts my spirits in the long never-ending (or so it seems with four babies stuck inside, because bundling up four under three years of age, nope) winter. If you follow me on Pinterest you can see when my interests spike and what will likely be coming up next in the Duffield’s life! Currently my pinning mood has been; garden, chickens, goats, and a granny suite. 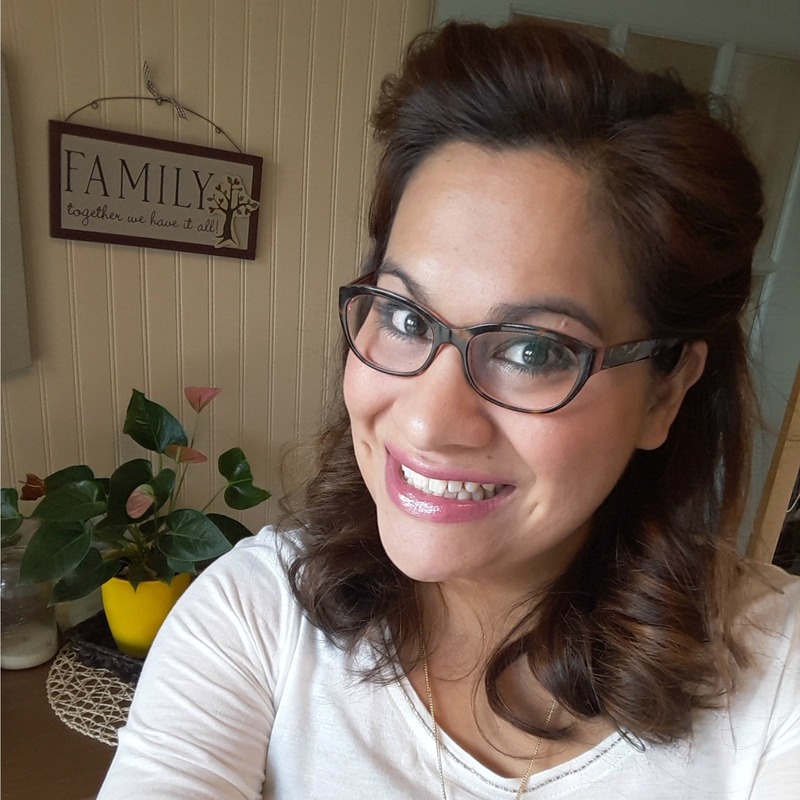 This winter with what seemed like lower immunity for all of us, I have tried to shift the focus towards healthier eating/paying attention to what I am feeding my family. Now we are far from perfect, and really I am more just gathering information, trying to learn a new life skill. I won’t pretend we eat organically, or that we always have healthy food. Even though our kids go through mountains of fruit and fresh veggies, we also eat KD, buy on occasion Fruit Roll Ups, and order in pizza. 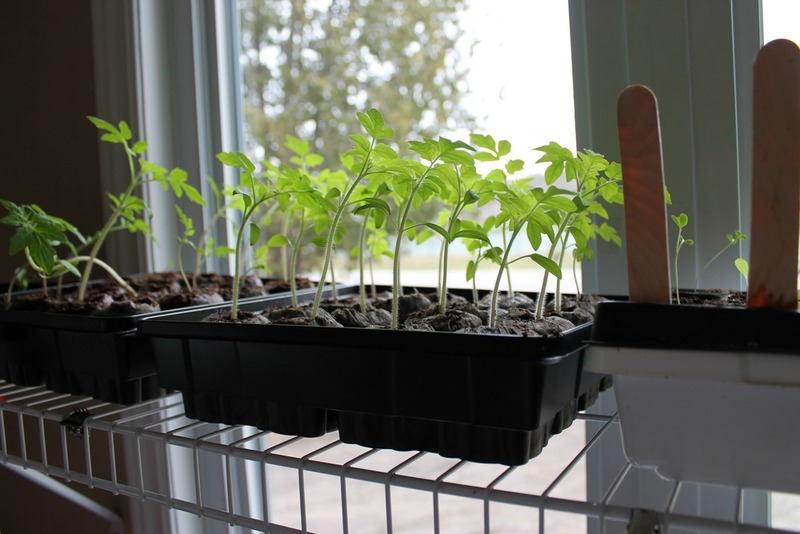 Last summer I tried growing vegetables in the raised box Joel made for me on Mother’s Day 2013. The first year we didn’t have enough in the budget to fill the box up fully with soil, we only filled one end and I grew a few flowers. 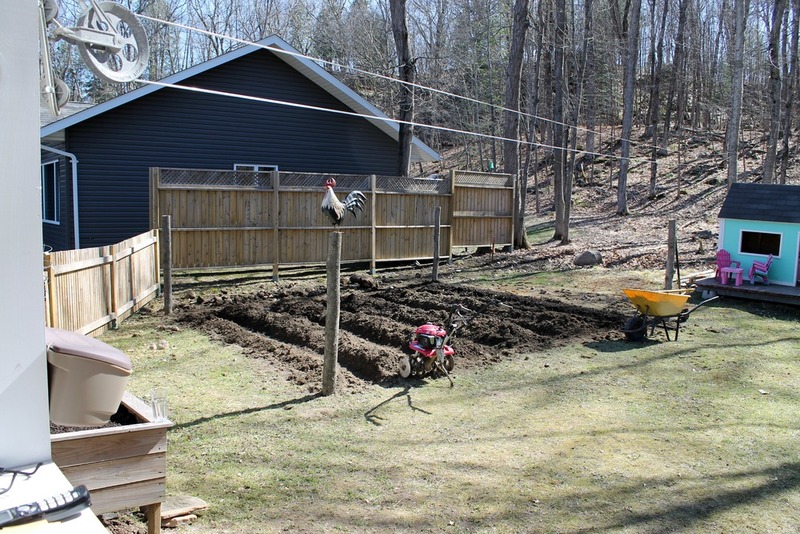 But last year we filled it with quality soil, fertilizer and put quite a few vegetables in there. Looking back now I think I put way too many plants in, maybe why they did not produce as much as I was expecting. This year I decided we needed to attempt a larger scale in ground vegetable garden. Okay to be completely honestly, I watched way too much “Alaska The Last Frontier,” and now assume we are true homesteaders. 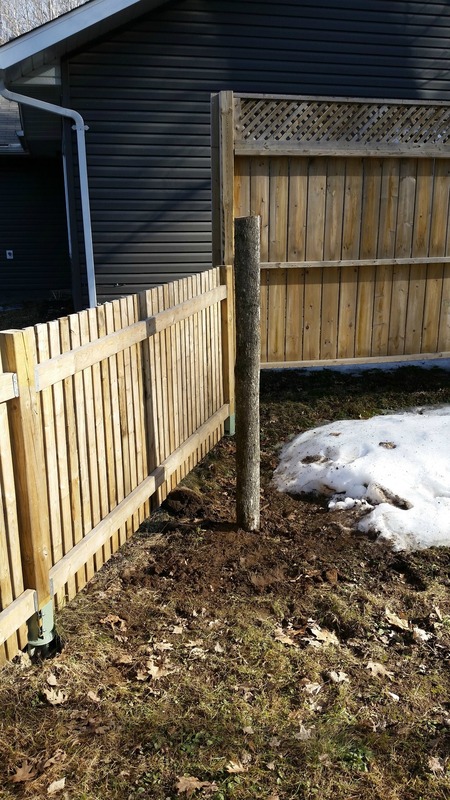 My plan was Joel would cut down a few trees from the woods in our backyard, this would not only clear more space for the kids to play, but we could also use the trees as ‘poles’ for around the garden (because deer netting is a must in Muskoka). Although Joel hasn’t been 100% on board the past few weeks, he is indulging me in my dream, and working hard to make this garden a reality. This past week as the kids started to come down with fevers, coughs, runny noses, and poor Hannah even had a few pox-like looking blisters appear, we decided to cancel my weekend plans. 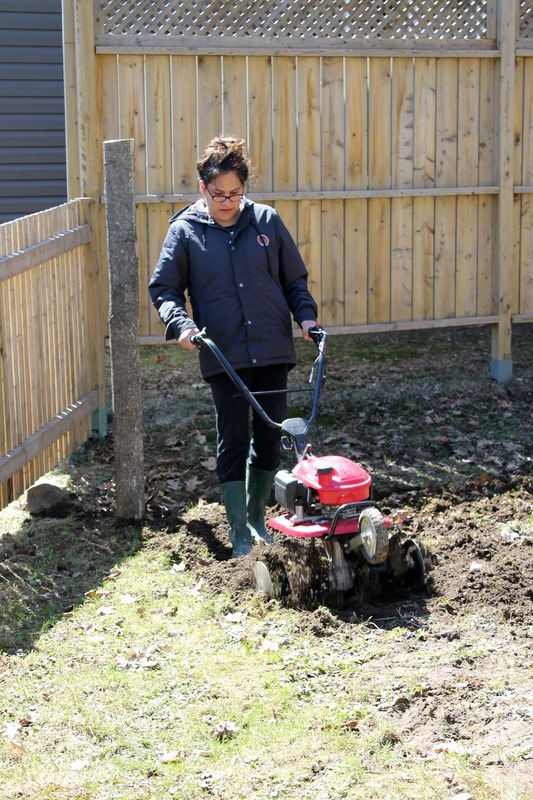 On Friday Joel rented a motor powered tiller to mark the official “we are getting the garden started” moment. So Saturday was spent outside – all the kids getting fresh air for good rest, and the coolness of the breeze keeping fevers manageable. Joel let me borrow his jacket while I did the work of tilling up the ground. 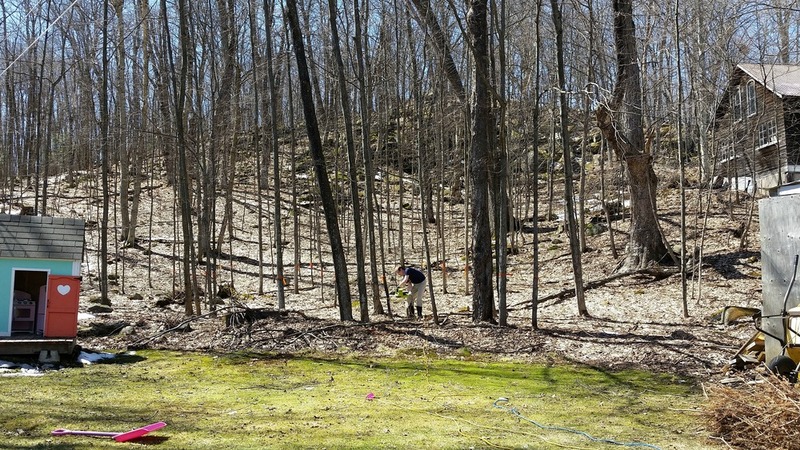 We were surprised at the numerous rocks and roots, but after a few hours managed to get the ground worked loose. Sam and Ben were interested in the tiller, they kept trying to climb into the garden and have a closer look at the machine. 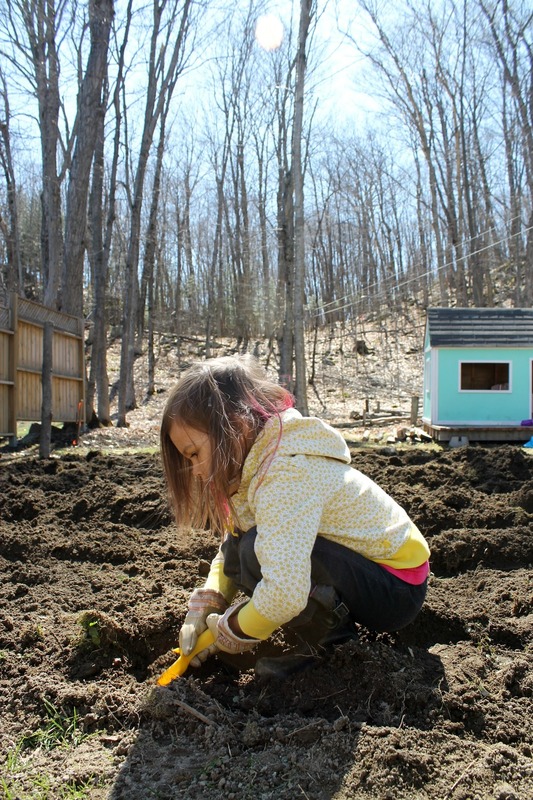 Violet, fever and all stayed outside the whole day helping us dig rows, spread compost, and look for worms in the woods. 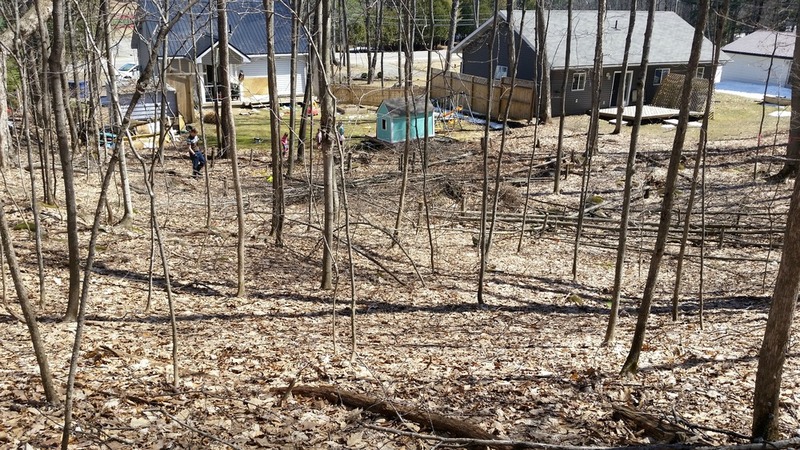 It was amazing to see our garden take shape, from totally grass covered – to raised rows covered with fresh rich soil found under the leaves in the woods. I attended a work shop at a local store in town, where I was able to learn quite a few gardening tips from a local farmer, and had the chance to plant a tray of various seeds. This was fuel to my garden dream at the moment. 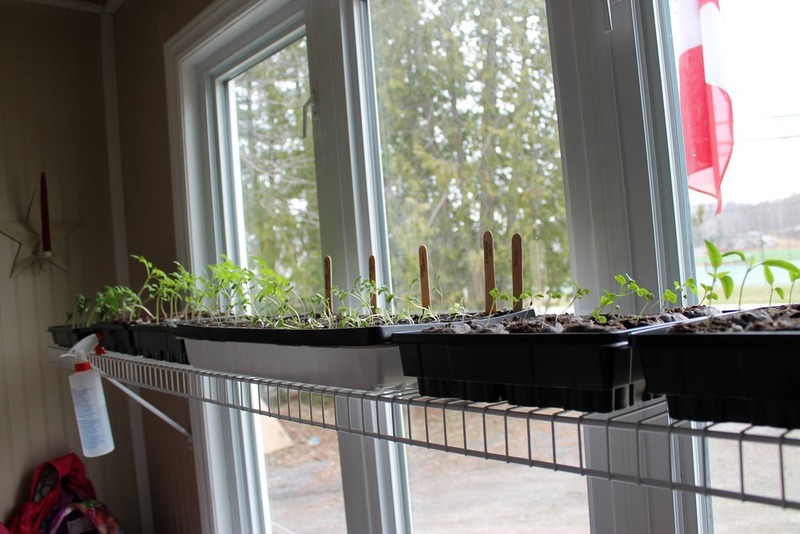 We have lots of little seedlings waiting in the window to come outside and grow! I actually think our tomatoes are getting too big for the little pods they are currently in, but it is far too cold for them outside. Same goes for the zucchini plants, they are HUGE. Hopefully I come up with a great plan over the next week, because May 24th feels like a long time from now! I am excited to add this project to our summer adventure list. 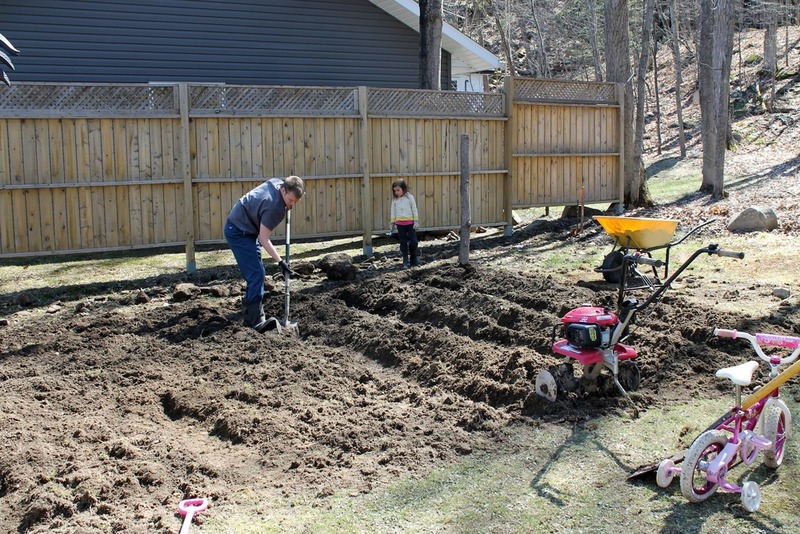 Having our kids help us through the whole process as we grow our food to eat is so exciting to me. 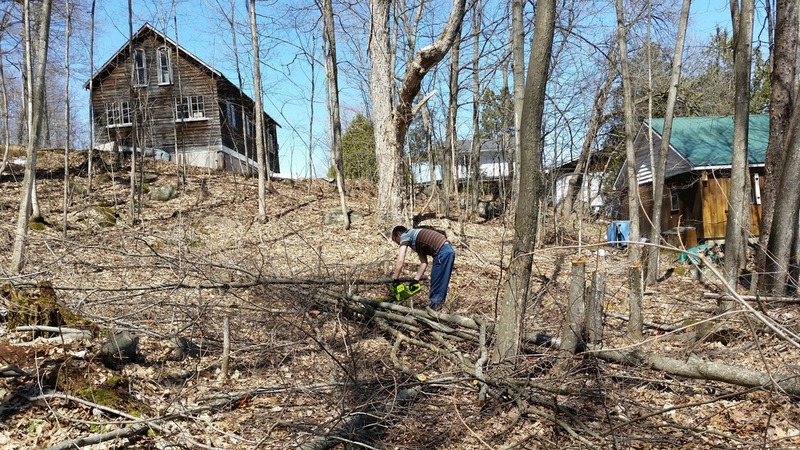 My dream is homesteading, but right now what is best for our family is being close to town/Joel’s work. Urban Farming, well that seems like a good compromise for us both at this stage of life! Thanks for joining along on this new adventure, I can’t wait to share more in the coming months with you. Thanks for reading Aunt Linda! We are very excited about growing food, having our kids learn where it comes from and about all the work that goes into growing quality food. I think we are so far removed these days from the whole process. Wish you lived closer too… maybe you can teach us about worms and compost when you come!